Your comment must be posted by 30 minutes before the Tuesday Feb. 23 class. You must include the URL of the column or blog item so that others can read it, too. Let me know if you have any questions. USA Today reporter Jeff Zillgitt is reporting and Tweeting from the luge and bobsled track in Whistler, B.C. Our own Ryan Harty is following Zillgitt. 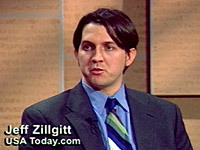 Zilli is a former student of mine at Michigan State; I hired him as a part-timer at the Lansing State Journal when I was sports editor there, then brought him to USA Today when I was online sports editor in 1995. This entry was posted on February 16, 2010 at 8:37 pm	and is filed under 3 things, Comm371. You can follow any responses to this entry through the RSS 2.0 feed. You can leave a response, or trackback from your own site. This week after Peyton Manning was unable to win the Super Bowl, Tim has put up a few posts talking about great Super Bowl quarterbacks. In one particular posts he has a list of 20 quarterbacks, five in 4 categories: Legends, Champions, Cling-ons and Gimps. One new thing Tim is doing is his “Speed Dial” feature in which he calls “three people in my cell phone address book and get their insight on a particular subject.” I think this is actually pretty cool and different and now that the football season is over, it’s a good way to keep readers interested. Apart from those, there were some new updates on AFC East teams, like the Bills cutting seven players and the Jets in negotiations to return to Cortland, N.Y. instead of their new complex in Florham Park, N.J. This week Bill Simmons did his annual NBA Trade Value column. He ranks the top 40 players in the NBA and their trade value. His theory is basically if Team A offered Team B player X for player Y, would Team B say yes or no? This years top 5 is 5. Kobe Bryant, 4. Dwyane Wade, 3. Kevin Durant, 2. Dwight Howard and 1. LeBron James. Simmons also has a list of the top 12 appealing contracts in the NBA. In contrast, he has a list of the 25 worst contracts in the NBA. Simmons lists the players who just missed the cut, and players who were on the list last year, but this year are not. I would include a link to my story, but this week I am actually going to comment on the USA TODAY article “Blog to discuss women’s sporting chances” by Christine Brennan that Professor Klein gave me in class Tuesday. I looked online to find a link for it, but was unable to do so. Sorry! The prospect of women’s sports getting more attention is particularly exciting for me, because as collegiate athlete myself, I have witnessed first-hand how male-dominated the coverage of sports in our society is today. And with that said, I certainly hope that this upcoming blog will help change the dynamics of that coverage for the better. Michael Wilbon wrote about who he thought were the two best teams in the NBA at the all-star break. He said the two best teams were the Los Angeles Lakers and the Cleveland Cavaliers. He said the Cav’s are going to have a tougher time to make it to the finals because of number of good teams in the eastern conference. He also mentioned that beyond the twp superstars the Lakers have a better assembly of players. Wilbon still predicts a Lakers Cavaliers NBA Finals. Today, columnist Bob Ryan wrote about a someone who is very familiar to him, well, only because of his name. Twenty-two year-old Bobby Ryan is on the US men’s hockey team and got a couple of his teeth knocked out of him during their triumphant 6-1 win over Norway on Thursday. Bob Ryan was worried about young Bobby, so he wanted to make sure that Bobby knew that he was looking out for him. Bob’s way of showing his pride was by listing off all of the interesting men out there with the name “Bob Ryan.” There is a singer-songwriter, an artist, a high school basketball coach, and many more. Bobby Ryan, one of the youngest members of the of the US men’s Olympic team, always had the dream to play in the Olympics. Not only is he ecstatic to be there, but Bob Ryan is pretty excited for him as well. Today (Feb. 19,) Chad Jennings already posted three blogs about the Yanks arriving in Tampa for spring training. He is focusing on the pitchers today. Jennings said the starters are taking it slow and not giving it all they have too early in spring training. They need to ease their way (and arm) back into the game. Hopefully I’ll get to see CC pitch when they come to Baltimore. Jennings often ends his blogs with a quote, which he did again this week. This week Dan Steinberg reports a Josh Howard interview from Comcast Sportsnet’s Chris Miller and Wizards insider Michael Lee. Howard, who was acquired by the wizards from the trader with Dallas, said that he wants the wizards to make the playoffs. Howard believes that helping the making the playoffs isn’t impossible since the team is 6 games out of the eighth and final playoff spot. However, Michael Lee of the Washington Post stated that the Charlotte Bobcats have the eight spot and on pace to win 41 games. For the Wizards have any chance of making the playoffs, they need to go 23-8 during the rest of the season to win 41 games. This week LaVar Arrington speaks about the Wizards basketball program and shows his optimism for the teams future despite their loss to the Toronto Raptors. He sat down and did an interview with John Riggins that can be seen on his blog in three sections. He also blogs about Tiger Woods and his apology on Friday. This weeks blogs are actually not written by Jack Bell. They are written by Women’s Professional Soccer player, Yael Averbuch. I found this extremely interesting because it is rare to get much coverage on women’s sports general, especially soccer. In Averbuch’s blog, we are given a day-to-day update of her trip to Portugal. The U.S.A. Women’s National Team is in Portugal to prepare for the Algarve Cup tournament. I found this interesting because this is exactly what our George Mason Women’s soccer team did on our trip to Brazil. Going to another country is such a great experience, and there is no better way to capture it than with pictures and daily journals. I was able to relate so well with this blog, and that is why it popped out for me. This week Martin Tyler dives right into some facts that have really shaped the Premier League this year. He shows a “what if” stat as a main focus this week. Normally he goes into stats that have already happened but with the uncertain future of Portsmouth FC, he has created a table that has all the games Portsmouth have played as null-and-void. With the table like that it puts Manchester United and Arsenal at a larger disposition as they would be further behind leaders Chelsea and leave them with less of a goal differential. On Friday, Grant Wahl wrote about Landon Donovan’s current loan spell at Everton, a hot topic in American soccer circles. Donovan is making the most of this opportunity and was voted Everton’s player of the month. Landon’s immediate future is clouded because he is scheduled to return to the LA Galaxy on March 15. That is a near certainty unless Everton and the Galaxy agree to extend the loan or do a transfer deal, both of which are not likely. Wahl pointed out something to me that I didn’t think about. Donovan usually plays right midfield but is playing on the left at Everton. Wahl knows Donovan better than most soccer reporters, therefore such analysis has authority. Gene Wojciechowski wrote a column on Friday regarding Tiger Woods’ press conference about his future. Wojciechowski believes that Woods’ apology was sincere and that he is on his way to a recovery. He argues that some people may have felt that it was forced, as it seems that he was just reading from a document. But people can’t expect him to have a powerpoint presentation prepared for his statement. He did look remorseful, and he only blamed himself. He also said he is not even focusing on his return to golf, but he is instead focusing on his family and getting his mind in the right place. Wojciechowski’s main argument is that Tiger’s televised apology wasn’t the end of the process, but it was a good, sincere start towards his recovery. This week Bill Plaschke wrote about the United States mens hockey teams win over the Canadians this past Sunday. My blogger was unable to blog this week. So I went and reviewed a few of his most recent posts. My blogger has been focusing on high school and college sports. But his most interest is in high school sports. I know that he writes more locally. But I am starting to remember his writing style. And to get a better grasp of what he is talking about. Jay Mariotti wrote about the victory that the US hockey team had over Canada this past Sunday during the Olympics. He looks at how this US Team, once thought to be a team that would not even sniff the podium for a medal, is now in serious contention to win a gold medal in Hockey, the country’s first since 1980. He also criticizes NBC for not airing the game on its own network and relegating the game to MSNBC where it was not even in High definition for the people that wanted to watch it. He also takes a shot at NHL commissioner Gary Bettman for remaining non-committed to having NHL players available to play in the 2014 Winter Olympics in Russia. Mariotti also comments on the national fervor that Canadians were riled up into over what was called up there ‘Super Sunday’ which was really interesting to hear how crazy it was up there because we have always felt that Canadians to be a rather relaxed people, not prone to such fervor that we see when Americans watch football or other sports. He jumps around a lot, but its important to see that he covers so many of the groups that this game meant to. This week Joe Posnanski took a break from writing about baseball to write a little piece about the 1980 USA vs Soviet Union Olympic hockey game. Posnanski did not write about the actual game, because everyone knows what happened that day, he instead choose to focus his piece on Al Michaels, the commentator for the game, and other things like the crowd. Posnanski starts off by describing how most Americans saw the game on a tape because it was only broadcasted live in Canada and had to wait to be shown in prime time in the US. He also talked about how the crowd was not excited or cheering until the third quarter, even though it was a sold out arena. Posnanski says this was due to the fact that Americans had nothing to cheer about until the third quarter when they realized that USA might actually win the game. Al Michaels said that he did not think of that line before the game but it just sort of came out in all the excitement of the final moment. Even today Michaels is never tiered of hearing people talk about his iconic line. This week Chad Ochocinco filmed a commercial for Reebok with Phillip Rivers but he complained it took forever. The funniest situation to read about was when Chad invited the first 45 people in running shoes to have dinner with him at a restaurant in Beverly Hills. The restaurant canceled on him at the last second, so Chad arranged it at a different restaurant in Hollywood….only to be told that they could not accommodate him at the last second, again. In this article Ian Thomsen talks about what NBA teams are like after the trade deadline. He said the Cleveland Cavaliers “are better than ever,” with Antawn Jamison. It makes me wonder, how come the Wizards were not better than ever with the Jamison and Butler? What I learned from Plaschke’s writting style is the flow of it all. He keeps his paragraph lengths to 3 sentences and then occasionally will have a well thoughtout one sentence paragraph that grabs your attention or contains an important quote. This week Dan Shaugnessy looked into the upcoming baseball season and the thought of pitcher Josh Beckett returning to the Red Sox this season. He is in the final year of a $30 million 3-year contract and the odds of him returning to the Sox are small, according to Shaugnessy. The title of this weeks blog was good players aren’t afraid to touch teammates. It was a very interesting article because every week Abbott seems to find a story in every aspect of the game, even team interaction. His paragraphs were a bit longer this time but still were easy on the eyes.